It’s finally here, the first entry in the Ordshaw series, available in eBook and paperback form. It was a joy to write, and from the initial responses I’ve received I think you’ll find it a joy to read, too. It’s up on Amazon in eBook and paperback format, and for its first weekend only it’s on offer at $0.99 / £0.99 on Kindle, in all territories (regular price $2.99). It’s free on KU, too, if you’re a member. An abducted youth. A book of horrors. A city with a nightmarish secret. Pax Kuranes has two simple ambitions: make rent and win a televised poker tournament. When a young man steals her bankroll and leaves behind a mysterious book and a string of murderous associates, her new ambition becomes to survive. 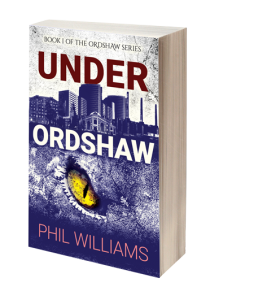 To do that, she’s got to uncover exactly what he was into – and face what’s lurking under Ordshaw. If you missed the extended preview, you can still get a look inside on Amazon to check out the beginning. Now that it’s out the gates, I’m hard at work on the sequel, provisionally called Blue Angel (which may give you an idea of what’s on the horizon once you’ve read Under Ordshaw). It’s another fast-paced ride into the Ordshaw universe, and will bring us all much closer to understanding the Sunken City. And between the two novels, the stage will be set for something much broader. By the time we’ve unravelled Apothel’s secrets, you’ll see there’s room for masses of thrills to follow. I’ve already got three more books mapped out for the series, to say nothing of the half-dozen others lurking in the shady corners of my imaginarium. But for now, we’ve got Under Ordshaw, and I trust you’ll find it a fitting beginning. Get it on offer now!